The presenting case is of a 10 year-old warmblood gelding jumper that presented for a decrease in peformance at the 1.4 meter level characterized by anxiousness, landing stiff over wide oxers and intermittently bucking and trying to run off after landing. The horse had no significant lameness history and works better at the 1.3 meter level. Examination revealed pain related to the right supraspinatus tendon, thoracolumbar, and lumbosacral regions; most prominent on the right side in the region of BL 25. A combination of 3 acupuncture treatments including electro-acupuncture along the lumbar and lumbosacral regions, and physical therapy (4 days a week) were used over a 2 week period. 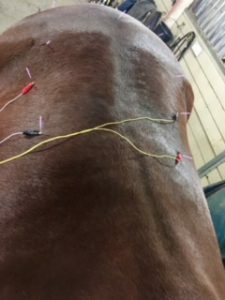 The results were both qualitatively and quantitively signficant such that the horse no longer landed stiff and did not run off bucking while in training, and apparent pain associated with the supraspinatus and BL 25 point resolved. Anxiety in the show arena did persist however at the higher level and it was elected to switch riders to improve confidence. The patient is a 10 year-old warmblood gelding jumper. He competes in the 1.3-1.4 meter jumpers. He started out doing well at the high level jumpers, but over the past year he has struggled to be consistent over the 1.4 meter. At this level he becomes stressed and tends to land stiff over the wide oxers, lock up on the bit and buck, making it difficult to collect for the next jump. He has not had a significant lameness history. He has had his sacroiliac joints injected with steroids, which has provided modest improvement as recommended by his veterinary chiropractor at the clinic. He also has had chiropractic care, which the rider feels has not had a significant effect. He is not on any medication and is otherwise a healthy horse presenting for decreased upper level performance. The horse presented with no apparent lameness and of good body condition. Evaluation of his head revealed no palpable soreness or abnormalities related to this region. Evaluation of his neck revealed no apparent palpable soreness, no trigger points, and good myofascial movement. He had a 25% decrease range of motion with lateral bending through the mid to lower cervical region bilaterally with no indication of pain. Cervical flexion was reduced by 25% toward the base of the neck. Evaluation of the scapula and shoulder and forelimb revealed good scapular lift and manipulation of the distal limb. Both shoulders had a 50% reduction in flexion/limb retraction, but had a full range of motion with respect to extension, and both internal and external rotation. Grade 3 palpable soreness was present over LI 15 and grade 2 over the muscle belly of the triceps on the right side. Evaluation of the back, pelvis, and hindlimb revealed good dorsal and ventral movement through the thoracic and cranial lumbar spine as well as lateral bending. The caudal lumbar spine was palpably sore at BL 21 (grade 2 bilaterally) and 25 (grade 3 right side and 1 left side). Ventral deviation of the lumbosacral region was stiff and sore. The SI joint had a mild restriction of movement characterized by a decrease in hindlimb extension and circling (grade 1 out of 5 bilaterally), but not palpably sore. The lumbar and gluteal myofascia was moderately tense. Clinical assessment of his examination led to the impression of significant lumbar and lumbosacral pain, which would explain the difficulty extending the lumbar spine over the wider spread of oxars. The previous work on the sacroiliac joints seemed to have had a significant effect in this region; the chiropractor was impressed by this result. The sore right supraspinatus muscle would explain the decreased forelimb retraction and the tricep soreness would correlate with landing over jumps. Neither of which are suprising given the horse’s use as a higher level jumper. The cervical flexion and bending restrictions were mild and should respond well to acupuncture and regular stretching. The horse presented for a decrease in performance that had been managed with traditional approaches to lameness evaluation and ultrasound guided sacroiliac joint therapy. Given his history, use and physical exam findings, it was elected to manage with acupuncture and electro-acupuncture with a focus on regions of apparent decrease in range of motion and discomfort (cervical, lumbar, sacral, and right shoulder region) and additional regions that are subject to increased stress with the demands of his athletic career (stifle and scapular regions). The rational behind treating these areas were myofascial release, improved blood flow, and pain management via inhibition of the nociceptive pathway and endogenous opioid analgesia. Electrostimulation will be used at a low frequency for longer-term endorphonergic analgesia. -Back: lumbar articular facet disease, kissing spines, and sacroiliac disease. – February 10, 2018: LI 16, GB 21, and Bai Hui were used as introduction and calming points. LI 16 and GB 21 were also used to treat the cervical tension via the cervical thoracic and spinal accessory nerves. Additional points used to treat the cervical region were LI 17 (a,b,c as recommended by Dr. Story) via the mid cervical spinal nerve. The sore supraspinatus tendon was treated using LI 15 directly over the tendon, and TH 14 via the suprascapular nerve. BL 11, 12, 13 were used for their effect on the girdle muscles, which are used heavily in a big jumper to support the thoracic limb to the body. These points were used for their activation of the accessory spinal, caudal cervical, and cervical thoracic nerves, which innervate the trapezius, rhomboideus, and serratus ventralis muscles. BL 13 also is important due to the way the saddle fits over this point. BL 18, 21, 23, 25, and 27 were used to treat soreness associated with these areas and for the clinical complaint of apparent discomfort landing over large oxers. Marked flexion of the thoracolumbar and lumbosacral junctions occurs during this phase of the jump, which could be the source of the horse’s discomfort. The discomfort could also be occuring during the mid-air phase at which time the dorsal spinous processes are compressing. These points were used to activate mid thoracic, thoracolumbar, mid lumbar, and the S1 spinal nerve. Electro-acupuncture was used along these points bilaterally using an ITO ES-130 unit at a continuous low frequency of 4 for its added endorphonergic effects. The tolerated amplitude across the lumbar region was a 2, and a 3 across the sacroiliac region. – ST 36 was also used for to neuromodulate the stifle via the fibular nerve as well as for its anti-inflammatory effects and somato-parasympathetic effects on gastrointestinal motility as a command point. Similar treatments were administered on February 16 and 22. The amplitude of the electro-acupuncture was tolerated up to a 3 over the lumbar and a 4 over the sacroiliac region during these last 2 therapies. The only adjunctive therapy performed during this time period was chiropractic therapy. This was peformed just prior to the final acupuncture treatment at which time the veterinarian noticed a substantial improvement that they attributed to the acupuncture; they actually felt it was the best they had seen the horse. The patient’s overall outcome was significant both to the rider and the veterinarian. This could be described both qualitatively and quantitatively. Qualitative to the rider, the horse was much more relaxed and supple under saddle. Most notably when landing after the jump, the horse did not buck and did not try to run off. This was consistent while training at home and in the warm-up arena. In the competitive arena, the horse remained tense at the higher level, which may be a learned behavior response. A new rider has begun competing with the horse, which seems to be helping with this aspect. Quantitative response to the thoracic limb, the horse’s supraspinatus tendon resolved after one treatment as did the sore tricep region. Quantitative response to the back, the BL 25 point resolved as did the left side BL 21. Remaining points were BL 18 and 23 on the right side, but remained mild at a grade 1-2. Qualitatively to the veterinarian, the range of motion through the shoulder via full limb retration improved by 25% and the cervical range of motion improved to normal range of motion. The response observed during the 2 week treatment period was, in my opinion, a result of both the acupuncture and physical therapy exercises performed between treatments. The chiropractic therapy was performed once and may have influenced the final treatment, however, the significant improvements to the rider were seen after the first and second treatments at which time the horse seemed to plateau. No other treatments were performed during this time period or during the 2 weeks of showing that followed. An additional treatment I would like to keep in mind in the future is electro-acupuncture over a sore tendon. Running the electro-stimulation parallel to the sore supraspinatus tendon would have been an interesting approach, which I discovered while reviewing the course notes after the treatment period. Although additional diagnostics would need to be performed to determine if spinous process pathology is present in this case as a potential sore point when jumping over wide spreads, Hua-Tuo-Jai-Ji points would be another treatment I would consider for this patient. I think this would also be an interest area for research as to the effects of these paravertebral points alone in the management of impinging spinous processes. Therapeutic approaches to this region have been discussed in terms of steroid therapy and surgical approaches including subtotal ostectomy of the effected spinous process, and interspinous ligament desmotomy, but I have not seen any published reports to the effects of acupuncture for this type of disease. The interspinous ligament desmotomy surgery has gained popularity for its positive outcomes and less invasive nature; however, the cause of these outcomes is not clearly understood. Assuming that the impinging spinous process is the primary problem and not an injury to the ventral supporting structures, the question remains as to whether or not this is more of a neurectomy type procedure. As advances in the understanding of the anatomy and innervation of this area come forth, so could the opportunity for research into comparative effects of acupuncture for this type of pathology. Interspinous Ligaments. Anat Histol Embryol 2017;46:223-231.